Spanks will be the sole runner for Ballymore Stables at Bendigo on Thursday. Spanks runs in race eight, the Benchmark 58 Handicap over 1400m with Mike Moroney utilising Liam Riordon’s claim to reduce the weight and making some gear changes. “She’s dropped right back in class and we’ve taken everything off her - the blinkers, the tongue tie,” Moroney said. “I’m just wondering if she hasn’t got a bit sick of all the bits and pieces so we’ll let her go around as she is. 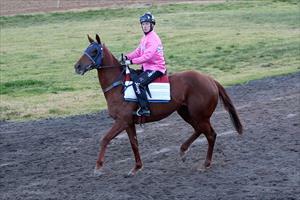 “Her work has been excellent as always and the day she races like she works then the form will turnaround. “Up in trip if she jumps well she can go forward and put herself in the race. Battle Zone was also accepted with but he has been scratched from his race.